Traveling out of the country? There are several things such as a Passport you are required to have. 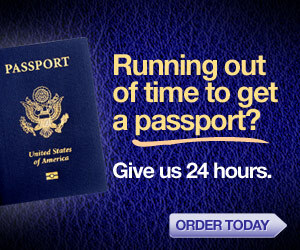 If you are traveling soon, we recommend using RushMyPassport.com for Expedited Passport Services. If you are not traveling in the near future simply fill out a passport application and you’ll be ready for your next adventure! Great hotels and cheap hotels for many European cities. World Nomads travel insurance aims to keep you traveling safely. Our travel insurance is designed for adventurous travelers and covers most adventure sports worldwide including skiing, snowboarding, ice skating and dog sledding. Make sure your new holiday gadgets return home with you. High value items such as jewelry, cameras, computers and other electronic equipment can be covered if lost, stolen or broken while traveling. During the holiday travel rush, baggage is more susceptible to getting lost, stolen or damaged en route to your destination. If your holiday gifts don’t quite make the journey, we can reimburse you for your luggage value. Another volcano with an unpronounceable name prevents you from attending your 10 year ‘Hikers are Hellcats’ Reunion. If your trip is canceled before you leave, or is interrupted after you’ve left, we can reimburse your cancellation costs (this can be for health, death, quarantine, transport and accommodation, legal, environment, canceled services, politics and violence, terrorism, work and U.S Armed Forces). Take it easy on the eggnog this holiday season. World Nomads does not cover you for anything that happens while under the influence of alcohol. World Nomads Travel Insurance is available to residents of 150 countries. You can buy, exten and claim online, even while travelling.